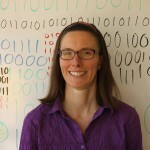 Sarah Sumner started to combine her love of working with children with her experience as a computer programmer in 2013, by teaching computer science for the STEM program at Acadecap. She has a B.Sc.H (Mathematics) from Queen's University, an M.Sc. (Mathematics) from University of Ottawa and ten years of software development experience in the high tech sector. Hexaflexagons – back by popular demand!